In the development of our game's plotline, we unintentionally ran into similar events from Stephen King's Firestarter. In the book Firestarter, the main plotline was that the government was conducting experiments on innocent people and trying to cover up these experiments. Furthermore, the government also wanted to harness the psychic powers by doing what ever it takes to control the individuals. In our narrative, we also have a drug/technology Corporation that developed a new drug to test on its patients where all its patients are willing college students but are unknowing of the side effects and the corporation's agenda on these test. The drug that our protagonist, Hero, took seems to have a side-effect which leads Hero to uncover many hidden events since the time he took the drugs and realizing his potential psychic powers. The actual events that strongly correlate to Stephen King's Firestarter are found in parts 1, parts 4 and the overall genre of our game. Another movie that our narrative unintentionally relates to was the recent movie, Identity, as well as the movie, The Sixth Sense. The main plotline of our narrative has many twist and clues which allows the player to decide on the fate and the "Good Guy or Bad Guy" character of Hero which is similar to the main concept in Identity and The Sixth Sense which forces the audience to use their own imagination to think of events in a different perspective than what is currently presented in the film at a given point in time. For instance, in Identity, we soon realize that all the actual events that occur in the motel were actually an imagination and existed only in the mind of a psychotic killer. Also, in The Sixth Sense, we soon realized the ending twist that Bruce Willis was a ghost which the general audience didn't seem to pick up on the clues until it all folds together at the end. The similar concept is strongly found in parts 2 and in parts 3 of our game where the player decides on the outcome of Hero based on how the player associates, comprehends, and interpret the clues that are found. The interaction style of our narrative would resemble of that in the games of Rise of the Dragon as well The Uncertainty Machine. Our city map would consist of a screen shot of all the places that the player must visit to finish the game but the actual areas that are present or accessible to the player are only areas that holds linear dependence to the storyline (e.g. the player must gather clues from area A and area B before area C is assessable to the player but the player could still see area C on the map, just can't go there). To go to a certain area of the map, the player would simply just left-click on the area name within the city map. Note that only the names of areas accessible to the player are highlighted while all the other area names are still left un-highlighted. If the player clicks on the areas that are un-highlighted, nothing would happen or there would be a message that says, "You didn't have privilege to access this area," or some clues that would tell the player where to go to next. When the player is actually playing as Hero, the main interaction would be the mouse. The player would use the mouse to move, walk, pick up items, etc. with just a click on a point on the screen. There would also be a menu screen were the player selects certain commands to set for the mouse, such as walk, run, etc. When the player selects a particular command, the mouse click is effective only for that command. For instance, if the player selects walk on the command, and clicks on one point of the screen, Hero would walk up to that point. Also, the cursor would change on items that could be selected or clicked. For example, if the mouse cursor if placed on top of a gun, the mouse cursor would change into another cursor such as a hand or something. We would have different mouse cursors when the player placed the cursor on top of objects within the screen so that the player doesn't have to click on every object. There would also be some sound effect when the player clicks on an object to give it a more interactive environment. There would also be an inventory box where the player would just drag and drop the item into the inventory box. To use the item, the player would open up the inventory box, and click on the item. Furthermore, we would have subtitles in the form of text boxes that shows the dialog between Hero and other characters. There would be time constraints within our game. To do this, we would force Hero to go to a certain place at a certain time by having Hero say, "It's getting late, I'm tired, and I'll think I'm going home in 5 minutes." Then have a timer counts down in 5 minutes or similar events. We would also have Hero say something like, "I don't know if it's the drug that I've took, but I'm think I'm going to pass out." Also, there would be a "VCR Control Knob" that the player would use to fast forward, rewind, play, pause-still, etc that is essential for the interaction in part 2 of our narrative. This VCR Control Knob would be similar to that of Cyberlink PowerDVD Player which is activated by the mouse. 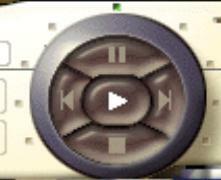 The player could fast forward or rewind by turning the knob with the mouse. The farther you turn it to the right, the faster the forwarding; farther to the left, the faster the rewinding. If you let the knob go, the movie plays at normal speed. The psychological perspective is always in first person view, hence the player is Hero, while the visual perspective of our narrative consists of both first person and third person perspective. The detachment of the player to character is accomplished via the changing of the visual perspective, and the psychological perspective is left unchanged. The first-person perspective is found in parts 1 and parts 4 while the third-person perspective is found in parts 2 and parts 3 of our game. The first person perspective parts of our game may correlate to the game Rise of the Dragon because the player isn't "distracted" by or "distanced" from their character, Hero, but focuses on the scenes and mystery he or she is involved in. In the third person perspective, it promotes the idea of a detachment from the player and their character, Hero. Since the player is detached from Hero and could see all of Hero's physical actions, the player could more likely perceive Hero to be guilty in the storyline since the play is not 100% Hero since they are in third person view. To help with the detachment of the player and Hero, we would have a several screens in parts 1 and 4 where the user gets to see Hero's face in first person view when the player looks at a mirror. Also, every time that the player finds clues (mostly in parts 2 and 3) and chooses the guilty path for Hero, we would have Hero's facial expression change or "morph" very subtly in third person view so that the player can see Hero change from an innocent face to a more guilty face. The "morphing" mechanism used would be similar to that of the advertisements made in the Hawaii Governor's elections in 1994 by Frank Fasi when running against Ben Cayatano as well as Pat Saiki except in the sense that it would be done very subtly so that the player can't really distinguish until about mid way through the guilty clues where it becomes obvious to the player. King, Stephen. Firestarter. New York: Viking Press, 1980. Identity. Dir. James Mangold. Konrad Pictures & Columbia Pictures, 2003. PowerDVD Version 5.0. Computer software. CyberLink, 2002. Rise of the Dragon. Computer software. Dynamix, 1991. The Sixth Sense. Dir. M. Night Shyamalan. Hollywood Pictures & Spyglass Pictures, 1999. The Uncertainty Machine. Computer software. Ratracer, 2003.